This neat little gaff sloop was designed for the Dublin Bay Sailing Club in 1896 by James E. Doyle, Dublin's leading yacht designer and builder. Originally a simple local one design racing craft, the class has remarkable history of spreading to three continents. 100 years later, she has now being revived by yachting historian Hal Sisk. Using the Dublin Bay S.C. plans, he has been faithful to the Doyle's original design. 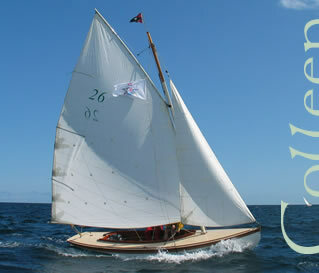 With modest changes to the cockpit seats, and provision of a well for an outboard motor, the Colleen has now become an ideal craft for comfortable day sailing and racing in the 21st century. And best of all, she's extraordinarily pretty!